A tibial sesamoid fracture is described. A female, while walking in an airport, experiences discomfort and pain under the first metatarsal head while wearing a high-heel shoe. Clinical investigation reveals a spontaneous fracture of the tibial sesamoid. The patient also has associated hallux valgus. Conservative treatment and surgical options are presented and discussed. The patient, after failed conservative treatment, had the sesamoid removed and a simple bunionectomy performed. It appears that a centrally placed tibial sesamoid with associated hallux valgus can cause a spontaneous fracture of the tibial sesamoid under the right circumstances. Tibial sesamoid fracture is common in athletes and active individuals. Usually, the incident is preceded by stress injury or acute trauma from stressed dorsiflexion or hyperextension of the hallux. The first ray will transmit about 60% of a person’s weight-bearing stress through the first metatarsophalangeal joint during the gait cycle. In acute instances, these stresses can be many times greater. Interestingly, there have been infrequent reports of tibial sesamoid fracture from non-acute injury such as walking. In non-acute injuries, many patients will present with a sharp initial pain followed by a dull ache or pain under the sesamoids. The differential diagnosis may include sesamoiditis, chondromalacia, first metatarsal joint capsulitis, flexor hallucis tendonitis and arthritis. MRI and radiographic evaluation are the most common modalities used to differentiate injury and fracture from more subtle injuries such as sesamoiditis or capsulitis. In non-acute injuries of the tibial sesamoid, conservative treatments are designed to de-weight the sesamoid and allow for healing. Conservative methods of treatment can include wearing a surgical shoe to prevent extension of the toe or even casting and non-weightbearing. Once the correct diagnosis is made, appropriate treatment can be initiated. Conservative care for sesamoiditis can also include wearing an accommodative insert with first metatarsal padding. The pad can be placed just behind the sesamoid in order to decrease stress through the sesamoid apparatus. Other conservative treatments include 1) NSAIDS, 2) avoiding high heels, 3) off-loading shoes and 4) steroid injection. These injections may be used along with joint taping to prevent excessive extension of the first metatarsophalangeal joint. Care must be taken in the injection of steroids to this region, especially if fracture is suspected. 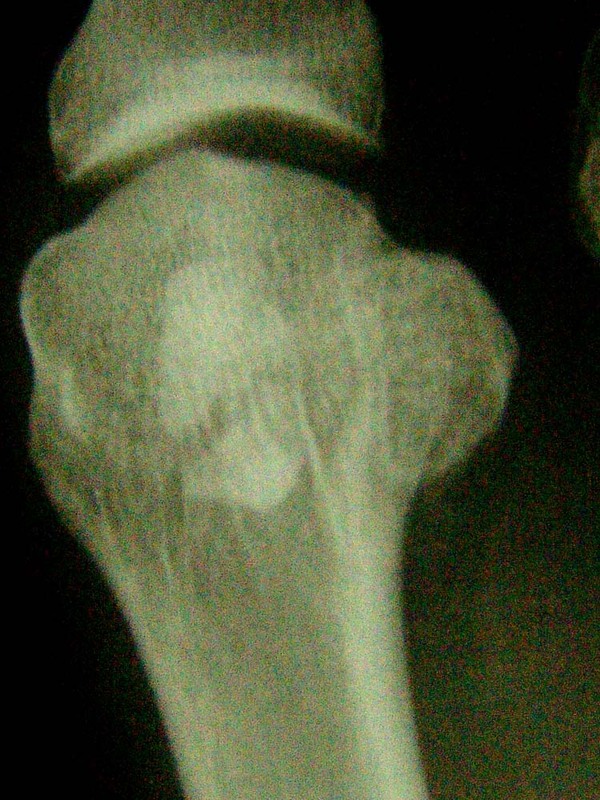 Injection of steroids can sometimes lead to avascular necrosis of a fractured tibial sesamoid. Once the tibial sesamoid fractures, these attachments tend to distract the fracture fragments. The vascularity of the tibial sesamoid is supplied by three sources: 1) the deep and superficial branches of the medial plantar artery, 2) branches from the lateral plantar artery and perforating branches of the dorsalis pedis artery, and 3) pole arteries through the length of the sesamoid. [4,6] One explanation for the high incidence of non-union is that the primary blood supply of all three sources originates from the proximal pole of the sesamoid through the tendon of the flexor hallucis brevis. Since most fractures of the tibial sesamoid are transverse, once the fracture occurs, the distraction causes disruption of this vascular communication leading to non-union. Bone stimulators may also be effective in the conservative treatment of tibial sesamoid fractures. They are certainly indicated after immobilization and non-unions are suspected. Figure 1 Tibial sesamoid position is radiographically described in seven positions. Position four is described as being directly under the crista of the first metatarsal head, likely increases stress forces through the tibital sesamoid. The fibular sesamoid (FS) will rotate even further into the first interspace between the first and second metatarsal as the hallux valgus worsens. It is commonly understood that these positions are dictated by the movement of the metatarsal head as the entire metatarsal subluxes medially in the classic hallux abductovalgus deformity. It is theorized that position four is the most stressful position for the tibial sesamoid and could cause tibial sesamoid fracture under the right circumstances. 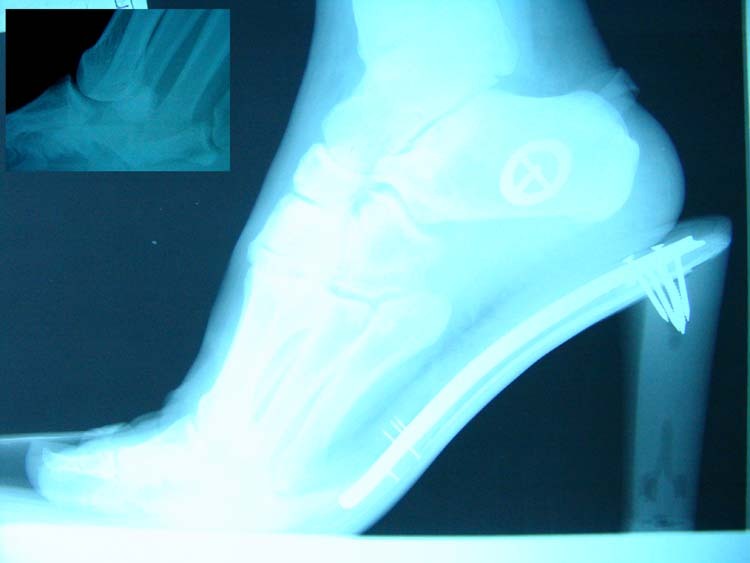 Figure 2 Radiographs demonstrate the increased hyperextension of the first metatarsophalangeal joint in a high-heel shoe. It is theorized that excessive hyperextension of the joint places increased pressure through the sesamoid apparatus. In February 2006, a 33 year old active female began to experience episodes of pain under the tibial sesamoid. She reported walking in the airport and experiencing a pain under the first metatarsophalangeal joint while in a high heel. She initially presented to another podiatrist, who diagnosed her with ‘fractured tibial sesamoid’. He instituted conservative treatment including padding and a local steroid injection. She did well for several months , but continued to have episodes of increasing pain. Figure 3 Radiographs confirm tibial sesamoid fracture. The fracture edges are irregular and sharp, consistent with fracture instead of bi-partite sesamoid. The tibial sesamoid is positioned directly under the crista in sesamoid position four. We placed her on crutches with off-loading for 6 weeks and progression to a Darco™ walking shoe, then athletic sneakers with proper accommodative metatarsal padding. Despite these attempts, she continued to have pain and we decided to schedule her for simple bunionectomy and tibial sesamoid excision. The patient was brought to the operating room and underwent simple bunionectomy and tibial sesamoid excision. A medial incision is made along the border of the first metatarsophalangeal joint. Care must be taken to identify the medial cutaneous nerve or ‘bunion’ nerve. The medial cutaneous nerve has variable branches and may run a course more medial and inferior to the dorsomedial branch. Once the nerve is identified, a medical capsular incision is made and the fracture is identified. (Figs. 4ab) Care must also be taken when excising the tibial sesamoid. The sesamoid is encased along the capsular tissue of the first metatarsophalangeal joint. It has attachments to the abductor hallucis muscle, plantar fascia, flexor hallucis brevis tendon, intersesamoidal ligament, medial metatarsal and phalangeal sesamoid ligaments. The flexor hallucis longus tendon also glides between the two sesamoids. Figures 4ab (a) A medially placed incision along the sesamoid is fashioned. Care is taken to identify the medial cutaneous nerve. (identified at the tip of the blade). (b) Once the capsule is incised, the fractured tibial sesamoid is identified. 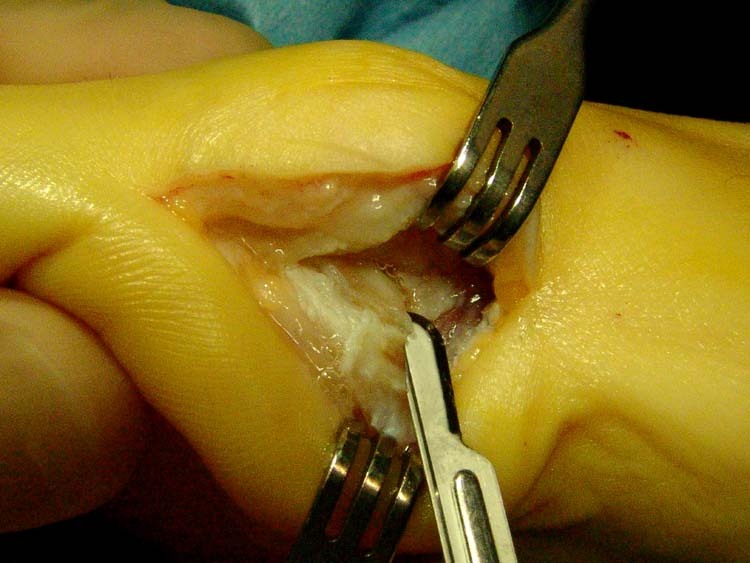 Care must be taken not to cut the tendon when excising the sesamoid. A number 15 blade is used to enucleate the sesamoid from these fibrous, soft tissue attachments. Once the sesamoid is removed, suture is used to approximate the ligamentous and capsular attachments. The sesamoid should be ‘cleanly’ excised with little tissue attachment. (Fig. 5) The postoperative radiographs reveal a post-excisional tibial sesamoidectomy with simple bunionectomy. (Fig. 6). Figure 5 After the tibial sesamoid fracture is excised, it appears as if the fracture recently occurred. There are no signs of attempted bone healing or calcification. This is testament to the distraction forces that keep the sesamoid fracture apart. Figure 6 Post-operative radiographs reveal removal of the tibial sesamoid and a simple bunionectomy performed. Surgical excision of the entire tibial sesamoid appears to be a viable alternative of treatment to non-healing fractures of the tibial sesamoid. One of the earliest reports of tibial sesamoidectomy with relief of symptoms was described by Müller in 1911. Recently, Jones et al., reported the results of tibial sesamoid excision following tibial sesamoid fracture in a softball player. After 1 year, the patient was “free of pain in all shoe types”. There is only one report to date of attempting internal fixation to repair the tibial sesamoid fracture. In this particular case, the association of hallux valgus and the placement of the tibial sesasmoid in position four appear to increase the likelihood of fracture when wearing a high-heeled shoe. The association of hallux valgus as a risk for tibial sesamoid fracture was first described in 1929, although most cases of fractures are related to direct trauma and a sudden increase in weight-bearing force, Hobart reported “an association with hallux valgus is often found”. Anatomically, the central rise of the crista may explain the increased force through a sesamoid. Stressed dorsiflexion in a high heeled shoe after extensive walking could directly lead to spontaneous fracture. 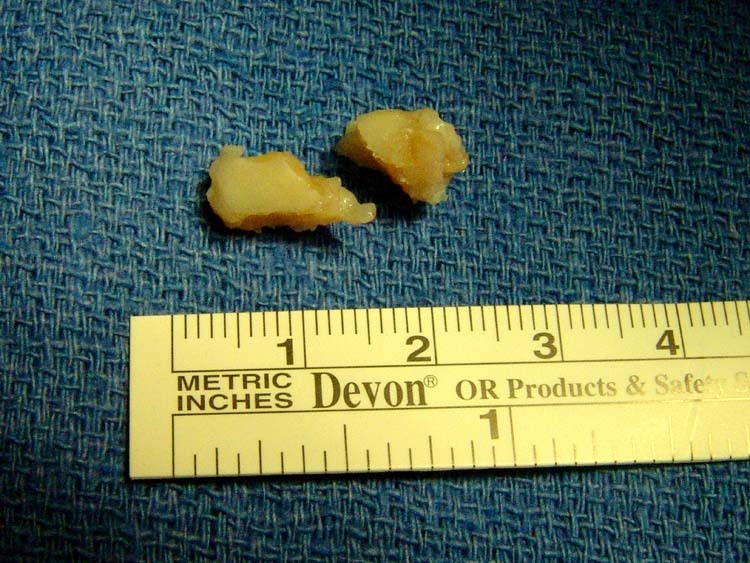 In this case, our surgical goals were straight forward: simple bumpectomy with sesamoid removal. To date, the patient has returned to activity with accommodative sesamoid padding and without pain or discomfort. The tibial sesamoid fracture is now demonstrated to be a common fracture of the foot. The diagnosis is usually made by clinical presentation, using radiographs and MRI for confirmation. Bone scans can also be used. The stresses placed through the metatarsal head during gait can be complicated. This report suggests that an abnormally placed sesamoid due to associated hallux valgus or bunion may lead to increased stress of the sesamoid and can lead to fracture. This is especially true in patients who attempt to walk for extended periods in a high-heel shoe. It is suggested that patients with hallux valgus wear a simple accommodative device, such as a dress orthotic, in an attempt to off-load the stress through the sesamoids. This case also demonstrates that if the sesamoid does fracture, total tibial sesamoidectomy is a viable procedure in cases of non-union or delayed healing. 2. Neerajana, DODA, Wilfred, C.G. 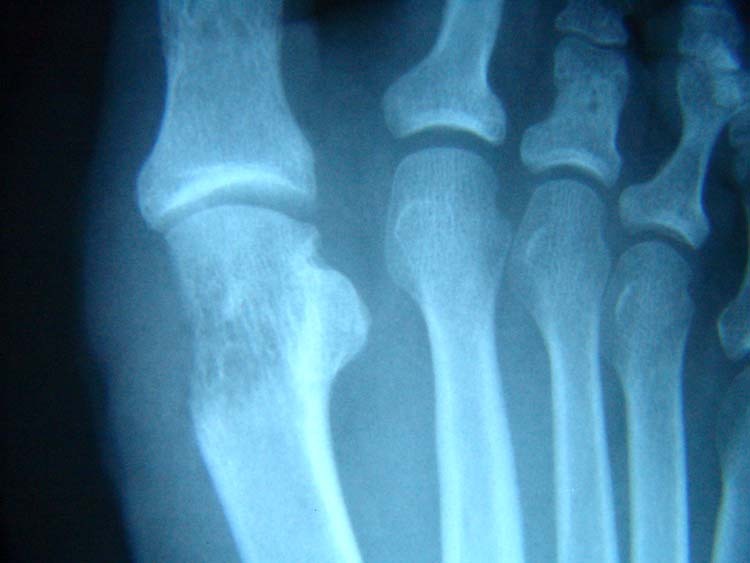 PEH Woman with possible right toe fracture: Radiology Series Asia Pacific Journal of Family Medicine, Volume 5, Issue 3, 2006. 3. Rodeo, SA, et al Diastasis of bipartite sesamoids of the first metatsophalangeal joint. Foot Ankle, 14(8): 425-34. Oct. 1993. 4. Swierzewski, J. Acute and Chronic Injuries to the Sesamoids: Etiology and Treatment CPMA, Vol 10, No. 4, Fall 2001. 5. Jones, J.L., Losito, J.M. Tibial Sesamoid Fracture in a Softball Player JAPMA Vol. 97, No. 1 Jan/Feb 2007. 6. Banks, A.S., Downey, M.S., et al McGlamry’s Comprehensive Textbook of Foot and Ankle Surgery, 3rd ed. Lipcott and Williams, 2001. 7. Riley, J., Selner, M. Internal Fixation of a Displaced Tibial Sesamoid Fracture JAPMA, Vol. 91, No. 10, 2001. 8. Hobart, M. Fracture of Sesamoid Bones of the Foot: With Report of a Case JBJS (Am) 11:298-302, 1929. This entry was posted in Uncategorized and tagged bunion, HAV deformity, Tibial sesamoid fracture, Uncategorized. Bookmark the permalink.